No doubt this was the first time they were ever in a motor boat. They got a special thrill out of going fast and turning back around to bounce over our own wake. This is something they can't do with their dug-outs! 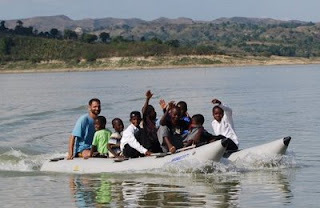 It would have been so rewarding to be able to give those children the gift of a motorboat ride!